← The most effective cardio to get you lean! All this hard work is leading me down a path I never would have pictured when I turned 30 in January this year. I clearly knew I was going to try a large variety of meats, many of them new to me. My ‘working’ list is just that, evolving each week. I’m constantly chasing more obscure or ‘out there’ meats. Some proving much harder to come by than others! What was it this week? As mentioned, it was another new one for me this week, however, not such an obscure one. It was Pheasant. Certainly not available for purchase in most supermarkets, but it’s out there to be eaten nonetheless. 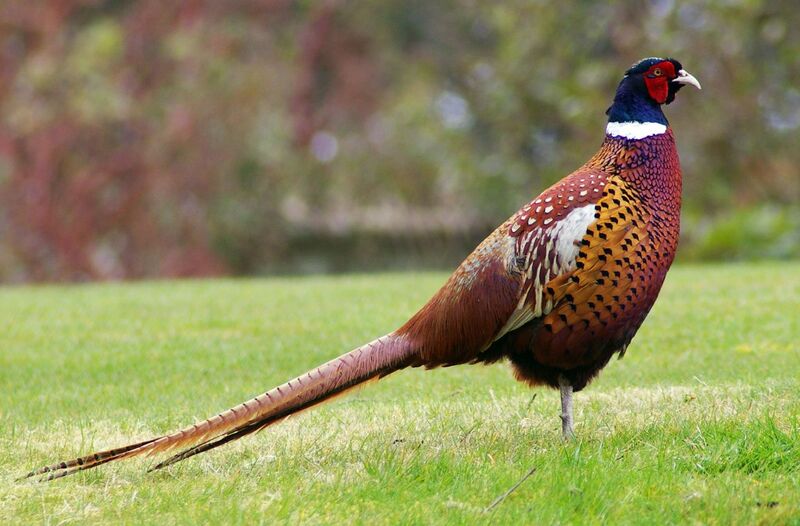 Common pheasant as this bird is known. Kind of cheapens the poor bird with the ‘common’ at the front there doesn’t it? What about just Pheasant? Simple and not in the slightest bit derogatory. I digress. This recipe required squeezing over the juice of half an orange then rubbing with salt, pepper, paprika and sage, before laying bacon over the breasts (not something you hear every day, ahem) and stuffing with the remaining orange, flat leaf parsley and garlic cloves. That sounds quite simple, but let me assure you it wasn’t. First off I had forgotten to buy the bacon. I decided to flag it. Then the same for the parsley. And ditto. Then upon realising I out was of foil to cover the dish I spewed a few expletives and stormed out into the cold night to the supermarket. 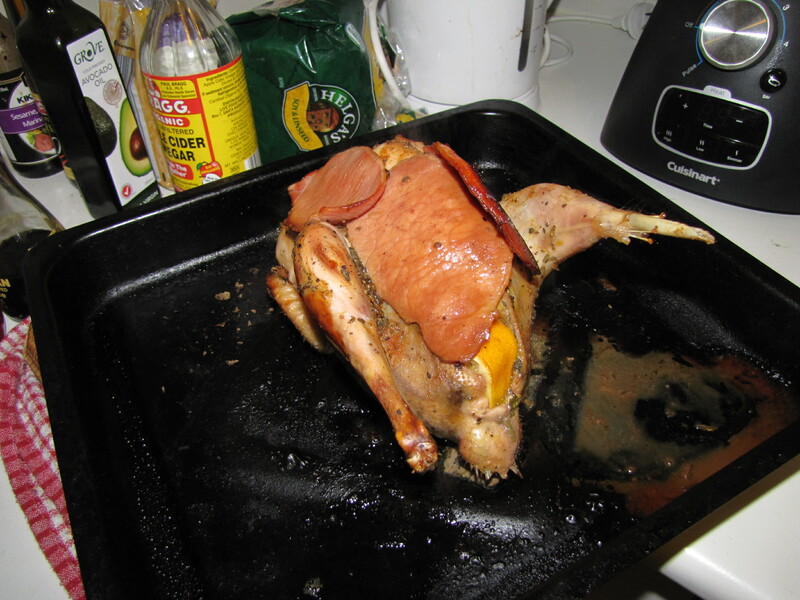 Eventually I was back in my toasty flat, the bird with bacon covered breasts was in the oven and the smells were wafting. Would it taste as good as it looked? Would it ever! This bird was beautiful. 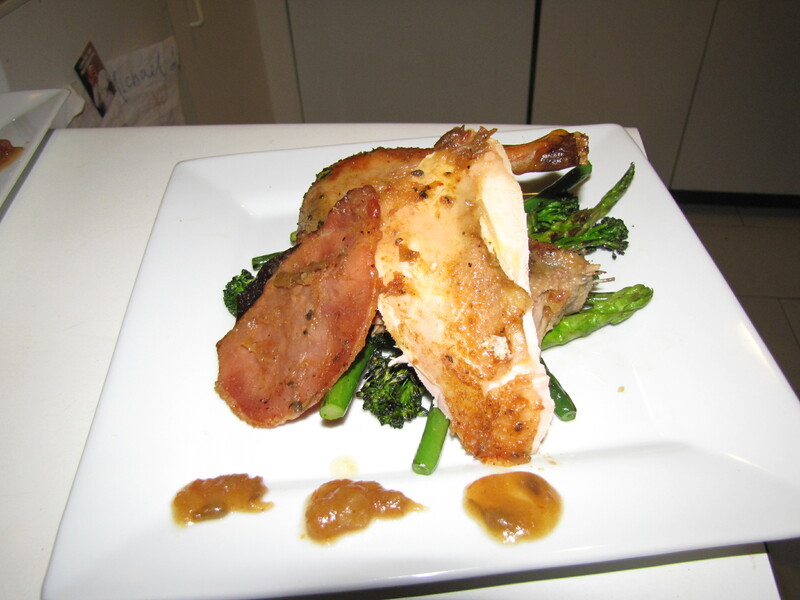 Slightly darker than chicken for the most part, and carrying a richer, more meaty flavour with it. The smaller back leg was a bit of a handful, literally, to negotiate, but the breast was utterly delightful. The flavours of orange and garlic shone through and I was soon feeling very primal with meaty carcass in hand getting what I could off this lovely bird. NN was the same and it brought us to a realisation that had the guinea fowl not been over cooked it would likely have carried a comparable fulfilling dining experience. To be honest- not if it’s going to be as costly as this one was, but most certainly if it is readily available. Just ensure cooking time is well and truly at the front of mind and pheasant makes for a smashing meat. Another one jammed pack full of wonderful nutrients and certainly a great substitute for other poultry. Pheasant is a fantastic source of protein, fat, vitamins and minerals, especially B6, niacin, phosphorus and selenium. What more could you ask for from your dinner? “Hey pheasant, do the washing up would you?” not likely. It is getting to the point where it’s more a case of what’s available each week, as opposed to any picking and choosing on my part. I would love to have a massive celebration for the half way mark next week, but I’ll just have to see how I go. Tom has mentioned one or two things, but until that time comes, you’ll have to tune in then and see what meat becomes number 26 in this year’s challenge to eat a different meat every week in 2012. What about suggestions? I’ve had some boomers and some much more questionable ones, but my list is always changing and I’m happy for it to do so. Please send me any suggestion you have, be it simple or weird and wonderful. If something is going to be weird for me to cook and eat it’s sure as hell going to be interesting to read about! Keep the feedback and questions coming, and as mentioned at the start- I should have some TV interview footage coming soon, so get in now before I’m swept up in a media storm of meat and Mike… On that note- watch this space for website launching soon. Please share this around on facebook and ‘Like’ my page and if you’re not on twitter get on and tweet my meat @mcampbell2012, much appreciated! Oh I’ve got a great idea for your celebration meat(s). A Turdurken en.wikipedia.org/wiki/Turducken. Alternatively, and I’m not even sure this is a real dish, but the traditional bedouin wedding feast of a stuffed camel would be a real crowd pleaser http://en.wikipedia.org/wiki/Whole_stuffed_camel. That’s fantastic! Ahh… I haven’t included at this point. Very far outside my comfort zone… Which instantly makes me think for that very reason I’ll have to do some! Umm… No.. way way outside my comfort zone! I think you should try first! It was just a thought yesterday when I was working out in my garden gym (gardening) and thinking of organic ways to treat the citrius trees for them come end of winter. If you do sink bugs, i would suggest you kill them out on your balcony and tell your neighbours to go out for the night! 🙂 Very pungent smell..
Or pick a less smelly bug.